My name is Addy McTague, and I am a junior pursuing majors in English and Religious Studies alongside a minor in Arabic. I originally hail from an incredibly small town in Ohio known as Elmore, somewhat near to Toledo. 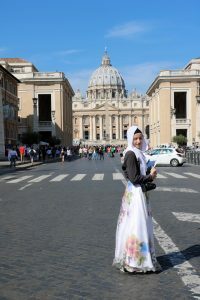 My year abroad comes as result of having been awarded Loyola's Ricci Scholarship in which I am conducting cross cultural research on the topic of the perception and expression of modesty among Muslim women in Rome and Beijing. From this research and any subsequent experiences I may have, I hope to acquire a better understanding of the influence of the majority cultures of Rome and Beijing on the minority population of Muslim women and how that carries over into the interpretation and practice of their religion. As a Muslim woman myself, I'm also interested to see what sorts of stutters in everyday life may arise out of simply being a woman who covers amidst a culture that may hold stringent connotations to such an image. It is week three in Rome and completing this blog entry has just been one of an ever-increasing collection of things I have to do. September 12 was the biggest holiday in the Islamic calendar: Eid al-Adha. It’s the holiday in which Muslims perform the the pilgrimage to Mecca: Hajj. Unfortunately, I have a Roman Catholicism class right in the morning and felt it to be a poor choice to try and skip it to go to the mosque. So I arrived in Piazza Cavour at 8:45 that morning with a new friend, Sara, and meandered about until the rest of the class showed up with the teacher, who is a priest. He’s a lovely fellow, incredibly friendly. He reminded us several times that what we were doing was a “mini pilgrimage.” From Piazza Cavour, across the river (twice), and to the Vatican, a student eventually nudged me to inform the teacher, Father Bohr, that that morning had in fact been the day for Muslim pilgrimage to Mecca. As a priest though, I didn’t expect him to take too much interest in the matter, but he did listen and eventually said he may ask for my help in planning for a lesson he does on Islam in the spring. In some attempt at being festive, I did dress up and text some people back home. The highlight of my day came when, upon leaving the Vatican and attempting to navigate back to the bus stop solo, a man who was advertising for a tourist service called after me: Assalamu alaykum! Eid Mubarak! There certainly aren’t many Muslims in Rome, but of the few they are, I greatly appreciate their presence. As a Ricci Scholar with a project focused on Muslims, I do have the privilege of seeing them more than one might usually see them in Rome. The research mentor assigned to me here in Rome, Sabrina Lei, is a brilliant Italian Muslim convert. She’s been Muslim for ten years whereas I’ve been Muslim for almost two. Today, September 23, was my second meeting with my mentor. We met at a cafe near the Cipro metro stop, a bit of a walk west of the Vatican. I greatly enjoy her influence in that she’s against the victimization of the self; meaning, though she’s Muslim and a Muslim-minority country, she refuses to herself as a victim. It’s a stance I quite enjoy for she seems rather at peace with herself and her environment. Even despite the occasional roadblock she encounters as a Muslim, she acknowledges herself as being in a place of incredible privilege and instead focuses her energy on being thankful for that privilege while navigating that privilege to see how it can be used for the benefit of others. This last point manifests in her and her husband, who is Indian and also Muslim, consistently publishing books — often Italian translations of popular Islamic philosophy books otherwise available in English and Arabic. Somewhat ironically, in taking the 990 bus back north towards the school after our meeting, I encountered a bit of a roadblock. The bus was utterly packed, yet a few bodies in front of me I spot an old man staring me directly in the eye. I hold his gaze. This little episode admittedly isn’t too strange: staring is a normal Italian cultural practice. However, he begins shaking his head several times over as I maintain eye contact and smile. By this gesture I assume he doesn’t like my hijab and think, so what? He certainly wouldn’t be the first one. As stop by stop goes by and bodies filter out, I look around and spot a familiar face: a woman sitting in the back who I know works at the dining hall here at the Rome Center. She smiles and calls me over to sit by her. It’s soon established that she doesn’t know English, but we’re able to maintain some form of small talk in Italian. She’s in her fifties. She has a few kids. She’s worked for Loyola for over five years. As we chat, the man who’d been staring at me suddenly steps in front of me and asks, in Italian, where I’m from. My companion tells him I don’t know Italian, but he asks again, so I tell him I’m American. He asks if I’m Muslim. Si. Always? No. I’ve been Muslim two years, I say, to which he asks why? I shrug seeing as that’s not something I can convey over the course of a brief bus ride, let alone in Italian. And with that, his demeanor very evidently sours. He begins preaching, telling me I need to be Christian, telling me he used to be Muslim and became Christian (which was very obviously a lie). He says my hijab is ugly, he pulls at an end of it saying I need to take it off. This little confrontation barely progresses five seconds before my companion yells at him, shooing him away, and announcing that I’m perfect before grabbing my face and twice kissing my cheek. He gets off at the next stop as she converses with surrounding patrons about how he’s crazy. Soon, we get off to walk to the school together. She made a point of sticking by my side, and I must say I’m quite thrilled to have found a friend out of her seemingly maternal desire to protect. That man may have stirred tension in confronting me, yet his confrontation created a closer friendship between me and my companion. I’m quite thankful for it, actually. I’ve settled into a habit of falling asleep at earlier and earlier times. My usual frame of a 1am-2am knockout has turned into a 9pm-10pm drift-off. While this is an advantageous thing on most fronts — after all, I’ll be needing to account for a seven hour time difference soon — it means I’m often asleep long before my roommates. Meaning: when my roommate Hiba texts me at 11:10pm I, in theory, won’t see it until morning. However, this morning, I happened to stir around 2am and catch sight of her message: Sunrise is at 6, wanna be up by 5:30? 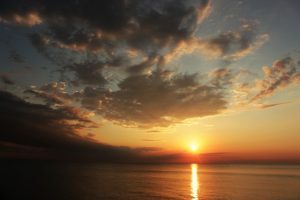 Loyola’s MSA (Muslim Student Association) has a little tradition bookending each academic year in which whoever feels up to it is welcome to join a generally small congregation to the east of the Madonna della Strada Chapel for fajr by the lake. 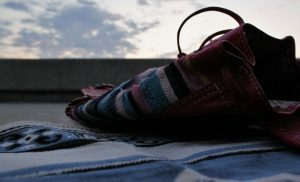 For those who may not know what fajr is: a great deal of Muslims follow a theology that prescribes five daily prayers. Fajr is the early morning prayer, before sunrise. Whereas the MSA doesn’t host fajrs by the lake over the summer, Hiba and I intermittently venture out there ourselves because, let’s be honest, it is awesome. I mean that not by the word’s connotation, but its denotation: inducing awe, admiration, or an overwhelming feeling of reverence. Clouds make up the most awe-inducing sunrises for me. With even just the slightest smattering of clouds, a spectacular palette of pastels wraps itself between the shadows. This morning’s just so happened to have a thinning storm cell easing in from the north that served as a sort of cradle for the light. The tail end of the cell sat just beneath the sun after it had risen a bit from the horizon, and by the end of the hour, you could see it dropping rain over the lake. If there’s one thing to be learned about me, it’s that I thoroughly adore rain and storms. Hiba does as well. Maaria, on the other hand, another roommate of mine, is utterly petrified by them. Last summer, when Maaria and I first moved into an apartment together, we spent many a stormy Chicago night stationed at our northeastern window watching the lightning. I crouched at the sill with eyes wide while she often stood a few feet back, sunk into her shoulders as though needing to defend herself. Watching storms with Maaria always makes me think of a verse in the Quran: “Among His signs, too, are that He shows you the lightning that terrifies and inspires hope…” 30:24 [M. A. S. Abdel Haleem translation]. Toss the two of us into a storm and watch what reactions manifest; I feel we tend to illustrate that verse rather accurately. Of course, with Hiba added to the dynamic, the three of us now spend most storms with Hiba and I quite literally hanging halfway out our fifteen-story-high windows, arms splayed, and at times becoming downright drenched while Maaria tentatively calls us back inside from the wall furthest away. This morning, Maaria was in the suburbs with her family so it was just Hiba and I for fajr by the lake. As soon as 5:30 hit, the two of us were out the door, walking less than a block north from our Sheridan Road apartment to the Lakeshore Campus. We spread out our prayer mats several feet to the east of the golden chapel doors and concluded our prayers in less than five minutes. Hiba set up her phone to capture a time-lapse, I took a few photos of the burgeoning sunrise, and we spent the remaining twenty or so minutes quietly commenting on the clouds and occasionally mulling over other things we’ve previously decided to do before my departure, like riding the new Ferris Wheel, visiting the Museum Campus, and holding a Lord of the Rings movie marathon. Truthfully, there’s only so much comprehensible conversation one can have in the last minutes of 5am; most of it was spent in a subtle silence. A sizable flock of birds frenzied in the shrubs to our left at each passing jogger, a security woman meandered around the footpaths by the Chapel gardens, and as soon as the golden hue of morning bloomed a bee fell into orbit about our scarved heads to which we could really only cringe and recoil lest we manage to make it angry. Subtle silence. Today marks thirteen days until my departure and two weeks until my arrival to Rome. I unabashedly admit it: I’m terrified. I’ve been abroad before, though never for longer than a month. Granted, many whom I know regard my move to Chicago as its own cultural dissonance from what I’m presumably used to — considering my upbringing in rural Ohio — but while I agree with that sentiment to some degree, Chicago doesn’t speak a language foreign to me. I know English. I certainly do not know Italian, but I suppose I will be learning. So again: I’m terrified. Though… I am quite amused with the mostly adult figures who attempt to ‘console’ me at my mentioning my fear. I understand the well-intended expression of support and encouragement, but a part of me genuinely wishes for there to exist a space in which this apprehension is allowed to be. There are many kinds of fear, and this isn’t so much the fear one feels when threatened, but rather the fear one feels when pushed to do something they’ve never done. Believe me, I very much expect of myself by the end of this to be turning to anyone who will listen, shouting “Let’s do that again!” But for now, just let me be wary. Dare I say a little trepidation can be a good thing? Maybe. For the time being though, my mind isn’t so much on what is to come of my new presence in Rome as it is on what is to come of my absence in Chicago. Hiba and Maaria. Having lived together for a year, I already know that leaving them will be my biggest grievance.